The gravity field combination model EIGEN-GL04C is an upgrade of EIGEN-CG03C. The model is a combination GRACE and LAGEOS mission plus 0.5 x 0.5 degrees gravimetry and altimetry surface data. The satellite data have been analysed by GFZ Potsdam (GRACE for February 2003 - July 2005 without January 2004) and GRGS Toulouse (GRACE and LAGEIS for February 2003 - February 2005). The processing standards such as arc length (GRACE: 1 day, LAGEOS: 10d), gravity field model (EIGEN-CG03C), ocean tide model (FES2004) or ocean pole tide model (Desai 2002) were identical on both sides. The only difference regarding the satellite processing is the ocean model used for correcting short-term mass variations (barotropic model MOG2D (GRGS), baroclinic model OMCT (GFZ)). 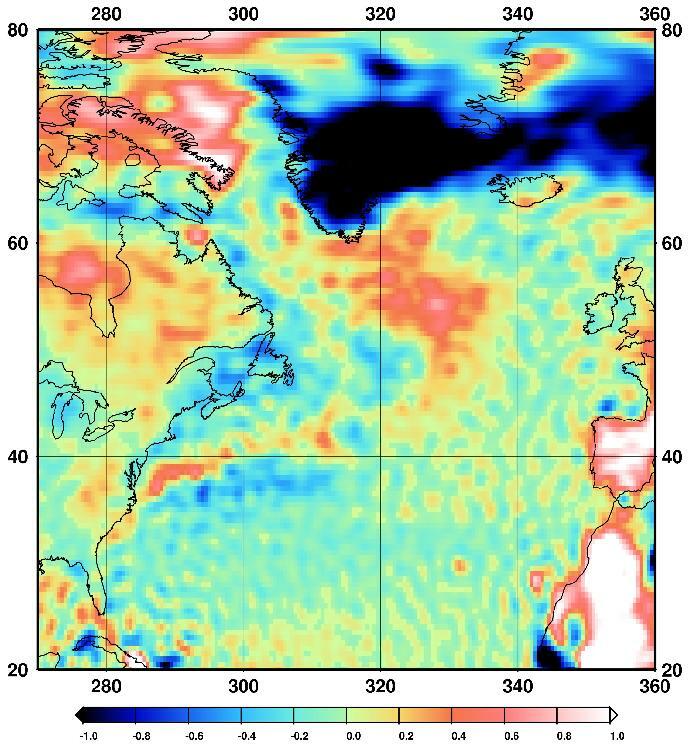 The used surface data are identical to EIGEN-CG03C except of the geoid undulations over the oceans which have been derived from a new GFZ mean sea surface height (MSSH) model (T. Schoene and S. Esselborn 2005, personal communication) minus the ECCO sea surface topography (EIGEN-CG03C: CLS01 MSSH minus ECCO) and that data with obvious problems have been substituted by EIGEN values (see Figure 2). As its precursor models, EIGEN-GL04C is complete to degree and order 360 in terms of spherical harmonic coefficients and thus resolves geoid and gravity anomaly wavelengths of 110 km. Again, a special band-limited combination method has been applied in order to preserve the high accuracy from the satellite data in the lower frequency band of the geopotential and to form a smooth transition to the high frequency information coming from the surface data. The improvement w.r.t precursor EIGEN models is reflected in different comparisons and tests. 1. Independent comparisons with geoid heights determined point-wise by GPS positioning and GPS levelling are shown for EGM96, CG01C, CG03C and GL04C using GPS levelling data from the USA (Milbert, 1998), Canada (Veronneau, National Ressources Canada, personal communication 2003) and Europe/Germany (Ihde et al., 2002) in Table 1. Table 1: Root mean square (rms) about mean of GPS-levelling minus gravity field model derived geoid heights [cm] (number of points in brackets). 2. The unrealistic meridional striping pattern in the precursor EIGEN models could be much reduced. This is mainly a result of the new GFZ MSSH data and of improvements in the GRACE satellite-only models. 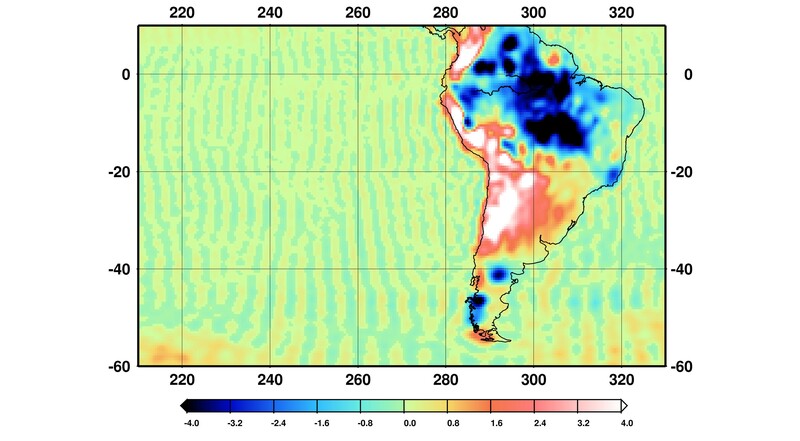 Figure 1: South Pacific geoid heights [m] of EIGEN-CG03C (left) and EIGEN-GL04C (right) after subtraction of a terrestrial gravity data based geoid. 3. 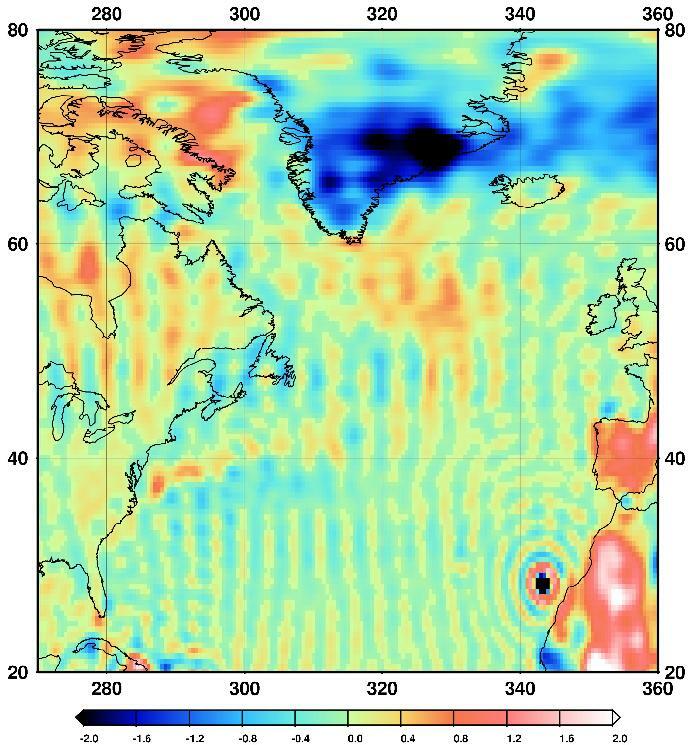 The unrealistic ringing pattern in the precursor EIGEN models was eliminated by substitution of Canary Island NIMA gravity anomaly data (which may have a wrong datum) by EIGEN data. Note also the reduced meridional striping over Canada for EIGEN-GL04C! Figure 2: North Atlantic geoid heights [m] of EIGEN-CG03C (left) and EIGEN-GL04C (right) after subtraction of a terrestrial gravity data based geoid (Note the different color scales). 4. Comparisons of geostropic currents computed from various geoid models with the World Ocean Atlas 2001 (WOA01) data (Stephens et al. 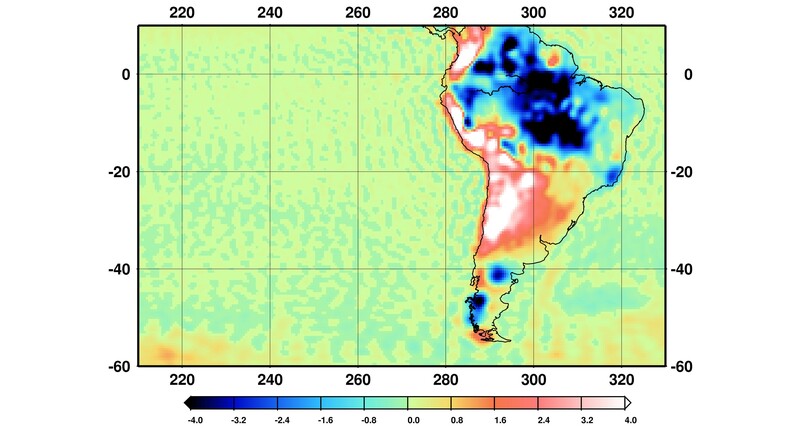 2002) relative to 4000 m and smoothed for 400 km show a higher meridional correlation for EIGEN-GL04C which indicates a more accurate marine geoid. A thorough description of the test can be found in J. of Geodesy by Tapley et al. "GGM02S - An improved Earth gravity model from GRACE". Table 2: Geostrophic current comparison with different geoid models (courtesy by John Ries and Don Chambers, CSR). Foerste, C., Schmidt, R., Stubenvoll, R., Flechtner, F., Meyer, U., König, R., Neumayer, H., Biancale, R., Lemoine, J.-M., Bruinsma, S., Loyer, S., Barthelmes, F., and Esselborn, S. (2008): The GeoForschungsZentrum Potsdam/Groupe de Recherche de Geodesie Spatiale satellite-only and combined gravity field models: EIGEN-GL04S1 and EIGEN-GL04C. Journal of Geodesy, 82, 6, 331-346, doi:10.1007/s00190-007-0183-8.